Most of us, Cafe regulars, are artists. We make art, we think about art, we sell art, we may even obsess about art and we definitely enjoy our time discussing art with our friends at the Ragged Cloth Cafe. Now, I have a question for you, my friend: do you live with art? I mean, physically, do you share your living space with art? Do you make space for art in your living room, your bedroom, your office, your garden? Do you like to live surrounded by your own work, or the work of others? Originals or reproductions? Folk, contemporary, or old masters? In your medium or in unrelated mediums? Are you building an art collection or do you prefer to focus on the art making and leave the collecting to others? My living room in 2002: folk textiles from around the world, ceramics and on the mantel a serigraph by the Spanish abstract painter Manuel H. Mompo. On the very right of the image a piece of mine: “Calligraphy 7”. The art I choose to live with is a small part of the art that interests me intellectually or emotionally. I like to surround myself with objects created to serve a practical function, and sometimes I use them, sometimes I only display them. I tend to display the work of others rather than mine, since I get to see enough of my work in my studio. I do enjoy prints, I actually do a lot of printing in my work, so I have a few serigraphs, woodcuts and etchings. Mostly though, it is textiles and ceramics: I just love how I can integrate them in my everyday actions. What about you? How do you live with art? Kate, you also live surrounded by your family’s art, all the way to your great grandmother’s mother! (did I get his right?). Wow! Mary, this is a great question. We have artwork & photos on nearly every surface in our house. Many of the pieces are my own art quilts, paintings, charcoal drawings and photography. But I also have fabric art, pottery, paintings & drawings by other artists; such as an oil-on-canvas done by a Croatian artist (from my husband Tom’s hometown). We have cross-stitch works by Tom’s mother and grandmother and tons of framed watercolors & finger-paintings by our kids. One of my favorite pieces is a small wooden sculpture of a young girl with a broom. On the base is the name “Kate”,roughly scratched into it with what looks like a knife or screwdriver. The name was scratched in there by my grandmother’s aunt Kate & the girl was carved by her mother. I love running my fingers over that crude, messy “Kate”, picturing her taking ownership of the sculpture with a kid’s penknife. People notice the artwork in our house & ask about its origins. I love that we have this collection of beautiful objects tying our family together. I feel like you could never be lonely in our house because you can see the handwork of loved ones everywhere. Mary, how wonderful to live surrounded by your family’s art. Over the years different generations get to contribute to the collection. The perks of belonging to a family of artists! I have always lived with art- My parents both painted- so there were many of their pieces on the walls of my childhood home. As I moved into the world on my own, my owm peices went up- mostly traditional quilts, now retired for my art quilts. My mother in law- Jacqueline Buchanan is a watercolorist from Green Bay and has gifted us with her work in various media over the years. As my incredibly talented children grew our home was blessed with their work- My son, Luke Miller Buchanan is an emeging artist in Raleigh, who has found his niche andd is lucky enough to sell his work regularly. I have pottery from friends and family, and wonderful photgraphs taken by friends and strangers. My garden is a constant source of inspiration- Art is all around- oh- and two small pieces of my own in permanent residence, as well! June, I do check what books people have laying around. So much fun and can get great conversations going. Putting your own work up as a form of self critique… you allow the work to give you feedback. I’d love to hear what your paintings and textiles have to tell you when you put them up together! Kathy, I’ve noticed that too. Indirectly it is actually what triggered this post. I started to notice many homes with no art. None at all. Beautiful furniture, beautiful floors, nice kitchens and blank walls. From there I got curious about the idea of art as a companion in life and decided to ask you all how you live with art. I have often wondered what strangers would make of the art and surrounds in our house. I sometimes go into houses of acquaintances and look to see what books are lying around and what’s on the walls; it tells me so much about the inhabitants. As for my own — well, along with the kinds of art one acquires over the years — prints and pottery and an occasional painting and textile piece — I put my own work up. I do so not so much as an ego trip (although it’s nice to see that I’ve actually done some work) but because it allows me to judge what I’ve done over time. As some of you know, I’m in the middle of a teeny crisis about painting versus textile work, and seeing the textile pieces on the walls makes me evaluate them as paintings — not always to their advantage. I haven’t put up my paintings yet, but it will be interesting to see how they compare and contrast. I have tons of art all over the house, some mine but mostly others, some inherited, some purchased myself. However, I’ve walked into quite a few houses of not friends, but parents of my kids’ friends, and they have totally blank walls…it looks just WRONG. I have many different styles of art in the house…I wonder if being an artist makes you want to surround yourself with it. I don’t know what the other parents think when they come to my house (except, why doesn’t she clean more? )…probably that the walls are too cluttered. Maybe it’s all inspiration to me. Susie, I like your idea of the house as a work of art in itself. Like creating an installation piece with the display of art objects around the house and affecting how the place is experienced by means of the editing you refer to. Clarian, you are definitely lucky! Thanks for sharing the wonderful story of your life with art. My siblings and I also pooled together our funds once to gift our parents an original art work. Yes, I, too live with art. I wish I could afford to buy more original art, but the pieces I have are among my biggest pleasures, I have art cloth by Laura Beehler hanging by the dining table. several amazing and powerful photo/drawing works by Santa Fe Artist Bobbe Besold, A watery wave of an acriylic by Terrell Smith (it’s actually my partner’s, who also owns some other great art posters and originals too. ), also large textile works — two African pieces and one very large tapa cloth that hangs over the sofa. Our media/dance room is a little gallery of friends works. Then I have a rotating show of my own work on the walls, it comes and goes with shows and sales. Then there is my Mexican folk art collection, some rugs and pillows, all as artful as I can afford! I think of our home as a work of art in itself, and it is very important to me to keep it fresh, keep changing, keep it breathing, and keep it as uncluttered as we can, while still having our “collections” of artful objects on display. That usually means some editing and self discipline about display! I have lived with art all my life. My mother loved art. Although we were very poor we had many reproductions of art (she and my father loved the Impressionists) around the house, and they bought student originals when they could, and had some friends who gave them their art work. They hung my blown up photographs when I was a teenager, and framed and put up my brother’s and my nephews drawings.. When I was a freshman in college, my brothers and I scrounged together $50 (a fortune in 1969!) and went to a gallery in Syracuse NY and bought my parents an original painting, modern impressionistic/abstract of trees. We all still love it! I started collecting art in high school. I had artist fiends. This has always been true for me, so I have art from every period of my life, all done by friends, in my house. I was a teacher for 20 years, never remotely imagining that I could be an artist. So I had made a fair number of art quilts before I could hang up my own. 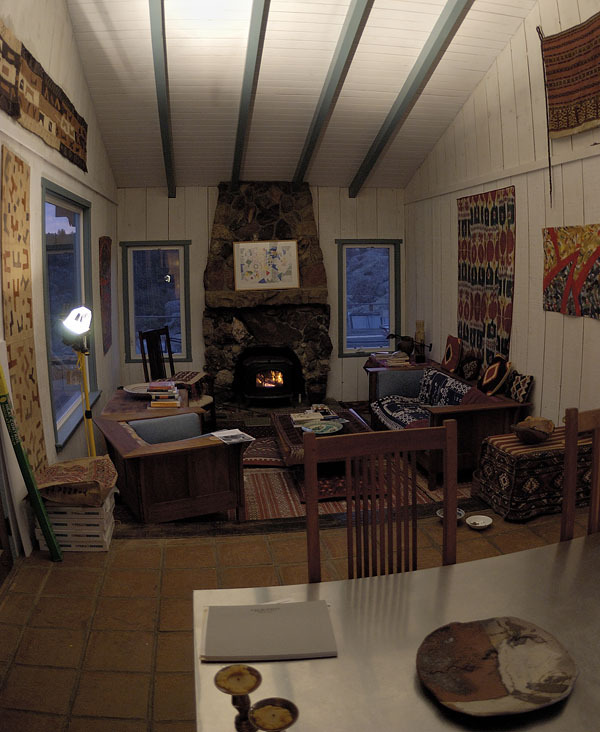 I have 15 small art quilts, some from SAQA members, many of Australian and NZ artists, in my studio, as well as a big piece by Ellen Anne Eddy, whom I have known for years. I have my daughter’s art wowrk from lower school Guatemalan and Hmong textiles in my bedroom, portraits in the hallway (in every media), mola in a downstairs bathroom, watercolors and pastels in our bathroom (and 1 of my pieces). My daughter started collecting masks when she was ten; she has a large collection in her room. My husband and I fell in love with the work of an MFA student at the Univ of Chicago (where we live), Blanca Lopez, about 15 years ago. We bought a piece from her student show, and have bought 4 pieces since. (They’ve gotten smaller and smaller as her prices have gone up and up.) I also collect Inuksuk (the stone sculptures done by Inuit) and black Pueblo pots from NM. I now have 7 or each displayed in the living room. Even our kitchen has artwork: a spoon and fork sculpture my parents bought in the Bahamas and original prints from friends in New Orleans. I live with art, look at it, study it, admire it, am captivated by it every single day. How lucky am I?